FANUC CRT to LCD Conversion | Lakeside CNC Group, Inc.
Lakeside CNC Group, Inc. charges significantly less than our competition for retrofit the FANUC CRT displays. You could save 30-60% off OEM FANUC repair, exchange and purchase list prices. We provide free repair reports and free technical support. Please call 630-616-0039 or request a quote online. Replace your old, worn-out FANUC CRT monitor in your machine. Lakeside CNC Group, Inc. offer a variety of LCD replacement monitors for your CRT displays used on FANUC and GE FANUC control systems. Our team of highly qualified engineers handles all repairs to the greatest level of professionalism always with customer satisfaction in mind. All FANUC CRT to LCD conversions are done using the highest level of technology available to us. We use best-in-class LCD panels to retrofit the worn-out CRTs, and we provide one-year warranty for all replacements for both labor and parts. At Lakeside CNC Electronics we don’t just repair the defective components, we also update, upgrade them due to the high rate of failure to preventing future problems at the same time complying with OEM standard. We repair most FANUC display units, including, but not limited to, the following series: A61L, A061L-0001, A61L-0001-0076, A61L-0001-0086, A61L-0001-0072, A61L-0001-0091, A61L-0001-0092, A61L-0001-0095, A61L-0001-0074, A61L-0001-0094, A61L-0001-0096, and A61L-0001-0168. Also, we have some original FANUC CRT displays for sale. Our FANUC CRT retrofit services come with 6 month warranty. We have some brand new and refurbished FANUC CRT displays in stock! 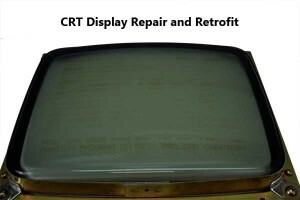 Please check out CRT Display Section in our online catalog!